A history of the Christian Early Childhood Education Association of Aotearoa (CECEAA). 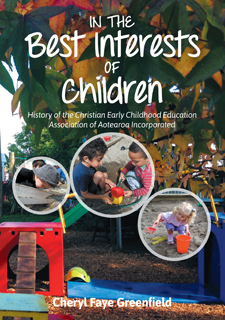 This book tells the inspiring account of the birth and growth of the very unique Christian Early Childhood Education Association of Aotearoa. It documents the history and the stories of those directly involved in its inception and continuation, and concludes with the current vision for the Association's future. An important book, it makes visible the contribution the Association has made to the New Zealand early childhood sector over the past 22 years. Cheryl Greenfield has been teaching for 42 years across the education sector, and for the last 22 years has been a senior lecturer in Early Childhood Teaching at Manukau Institute of Technology. Cheryl has been involved with CECEAA since 1993 and has served as an executive member and chairperson.